Measure the total length of the pole (A - excluding the finials) – do not measure the window unless it is wall-to-wall. 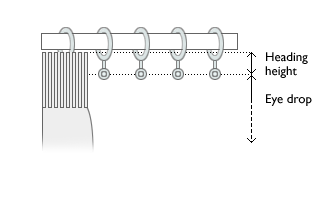 Don’t forget to allow for overlap – this is an additional measurement, normally 2.5cm (1 inch) that allows the hanging curtains to overlap in the middle when they are closed (see diagram). 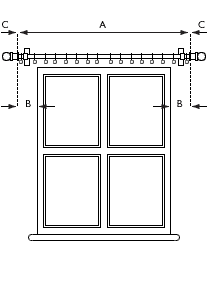 The measurement should be the length of the track (not the width of the window) because the track may extend beyond each side of the window to allow the curtains to be pulled right back. If you have a track which overlaps in the centre, measure the full length of the tracks Including the overlap (see diagram). Sill length curtains finish 1.25cm (1/2 inch) above the sill. Curtains that fall below the sill finish 15cm (6 inches) below. Floor length curtains finish 1.5cm (1/2 inch) from the floor (although you can create a romantic, Bohemian look by having them longer so that they actually trail on the floor). Please note: We will allow for hems and turnings. 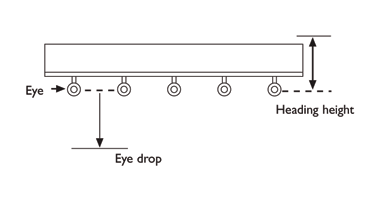 Measure from the eye – the small metal ring at the bottom of each curtain ring. This will prevent the pole or rings from being obscured by the curtain. You also need to measure the heading height from the curtain ring upwards. We recommend a heading height of 1cm for poles so that the curtain hangs below the pole, although you may choose a heading height up to 7cm. Measure from the very top of the pole. Measure the drop from the eye of the curtain glider. 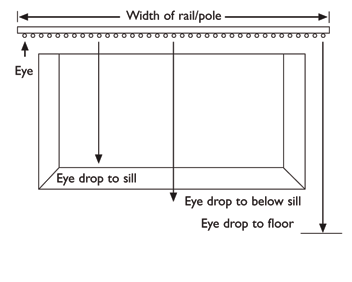 We recommend a heading height of 5 cm for tracks so that the track is hidden by the curtain, although you may choose a heading height up to 7cm. To be sure of the best possible fit, take time to measure your window carefully. We suggest using a metal tape measure for accuracy. The first step is to decide whether you want your curtains to hang from a track or pole, both of which should be positioned 15cm (6 inches) above the window and extend 15-20cm (6-8 inches) either side. Fit the track or pole before taking measurements. Ideally hang your curtain track or pole before measuring. To exclude light and draughts, we recommend that each curtain overlaps your window by 15cm in the middle. The width measurement should be the length of the track or pole (between the finials), not the width of the window. If the track overlaps in the centre, measure the full length of the tracks, including the overlap. Measure the heading height from the eye of the curtain glider or from the curtain ring on the pole, to where you want the top of the curtain to be. We recommend a heading height of 1cm for poles and 5cm for tracks. The maximum heading height is 7cm. Carefully measure the width from E to F (see diagram 2), adding a further 38mm (1 ½ inches) to take account of the operating mechanism. Measure from G to H to the length you require. Make a note of these measurements to the nearest millimetre using a metal tape measure. First ensure that the recess your blind is going into is not obstructed in any way so the blind can hang freely when fully extended. 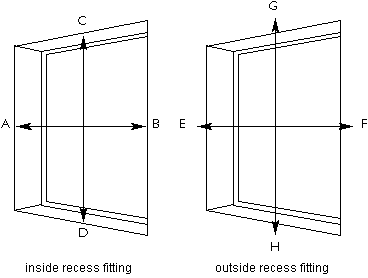 Make sure the recess is at least 75mm (3 inches) deep, otherwise it will not be able to accommodate the operating mechanism. Measure the total width from A to B and the length from C to D (See diagram 1). Do this in several places to allow for any slight variation or irregularity in your windows. Make a note of the narrowest of these measurements, to the nearest millimetre using a metal tape measure.